Pinterest is a mecca for users to share home decor pictures they love, or to post their own remodeling efforts within their apartment or home. Houzz has also become a go-to destination to share and find remodeling ideas and inspiration. So it makes sense for, Zillow, the online sales and rental marketplace for homes and apartments, to try to tap into this movement. 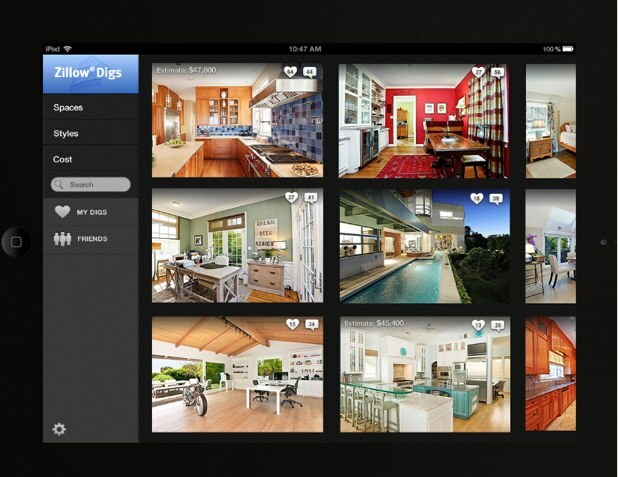 The the online real estate giant is debuting Zillow Digs, an iPad app and companion web app, that allows users to share and find photos of remodeling projects and home decor. 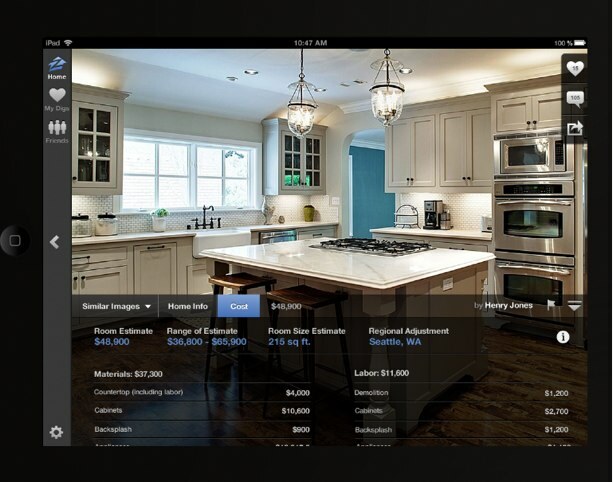 Users can browse tens of thousands of photos and see Zillow’s proprietary Digs Estimates for the estimated cost, based on where they live, of the actual bathrooms, kitchens and spaces they are viewing. Similar to the way that Pinterest operates, users can create, save and share Boards of ideas and décor they like, browse Boards created by others, comment on photos and follow people with similar interests and tastes. What differs from Pinterest (and this is Zillow’s secret sauce), is that not only will Zillow provide estimates of how much something costs, but it will also show you architects, contractors and designers that worked on the renovation or space. If not local to a viewers area, Zillow will recommend local home improvement professionals for help. Zillow CEO Spencer Rascoff says that the estimates tool is powered by a proprietary algorithm that analyzes extensive housing data and research. This includes data from local contractors such as size, materials, finish level, and regional labor and material rates. Another opportunity that Digs provides is for the actual professionals. The company says that contractors, designers and architects can create their own branded boards to showcase their talents and expertise. Considering the massive amount of sharing that takes place on Pinterest around home decor and remodeling, it makes sense for Zillow to provide this engagement for its users. There’s a natural tie-in for users who have purchased or found a home or apartment using Zillow to then see how they can then decorate their new digs.